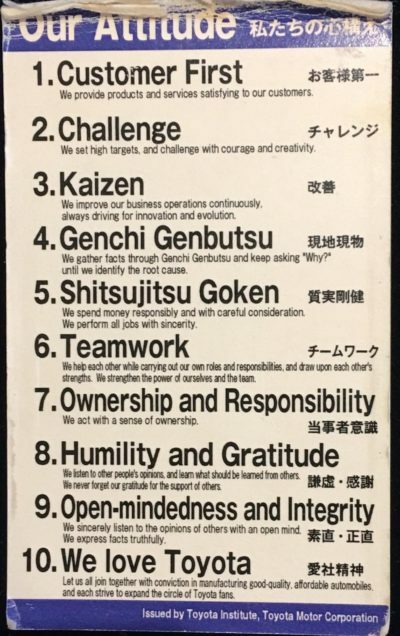 My colleague Kevin Hop drew my attention to this video of Kazuhiko Furui showing some examples of Karakuri Kaizen at Toyota, the training of Toyota employees in coming up with new devices, and the iterations that go into making them work. It goes deeper into the topic than the videos I had posted earlier. This is part of a series of videos called econohito, that shows actions by Toyota employees to avoid wasting power or water, and to collect electricity from solar panels. Perhaps the best way forward for sustainable development would be to shift away from cars altogether, but that’s not what this is about. If you google “data-science + manufacturing,” what comes back is recycled hype about the factory of the future. The same vision has been painted before and hasn’t come to pass, yet we are expected to believe that it will this time and that it will be a “4th industrial revolution.” Whether it’s true or not, this happy talk is no help in today’s factories. “Data science” covers real advances in the art of working with data, and the more relevant question is what it can do to improve existing operations.